The Aqia tree in Badagry, Lagos is one of the popular tourist spots for locals and foreigners. The area around the Aqia Tree marked the spot where Christianity was first preached in Nigeria. The tree isn't there anymore. A monument has been placed to mark the spot. People are known to travel from far & near to pray at the spot. It has its own form of pilgrimage. Reverend Thomas Birch Freeman, born to a Freed African Father and an English Mother, was the First missionary to preach on this spot in September 24, 1842. 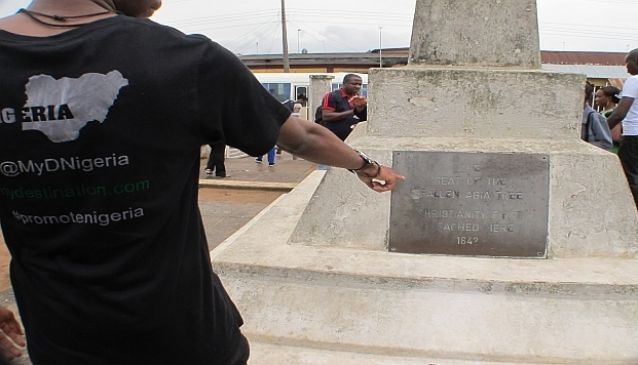 The First Christmas in Nigeria was also done at this historical spot. The Aqia Tree was uprooted by a rain storm in 1959 and a monument was built to mark the spot where it grew. The Methodist Church in Nigeria plans to erect a Chapel at this spot and plans are on going towards making this a reality. A chapel will attract more people who will come to pay pilgrimage to where Christianity first began in Nigeria. If you study architecture, you might notice a number of Brazilian styled houses opposite this historial spot. Notable is the Agrigbonwon's compound. Some of these houses were built by freed slaves who returned with skills, knowledge, experience in different trades. Some were builders, carpenters, ironsmith etc. These were employed by the people in Badagry to help build their family compounds. You can see the Badagry Heritage Museum, Island of No Return(Point of no return), 1st story building in Nigeria and more.